Believed to be “Burning Bush’ of Bible fame. Emissions of essential oil on hot summer evenings may be ignited to give perception of a burning bush. Lemon scented flowers in handsome spikes. Slow growing. Bark of the root used a a tea to calm the stomach. 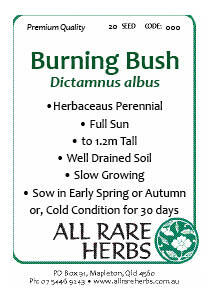 Burning Bush, Dictamnus purpureus, is native to Europe and Asia minor and prefers well drained soils in a protected sunny position. Frost and drought resistant . Herbaceous perennial growing to 1.2m. Be the first to review “Burning Bush, seed” Click here to cancel reply.